No heavy cream or corn syrup in this Healthy Peanut Butter Chocolate Fudge! 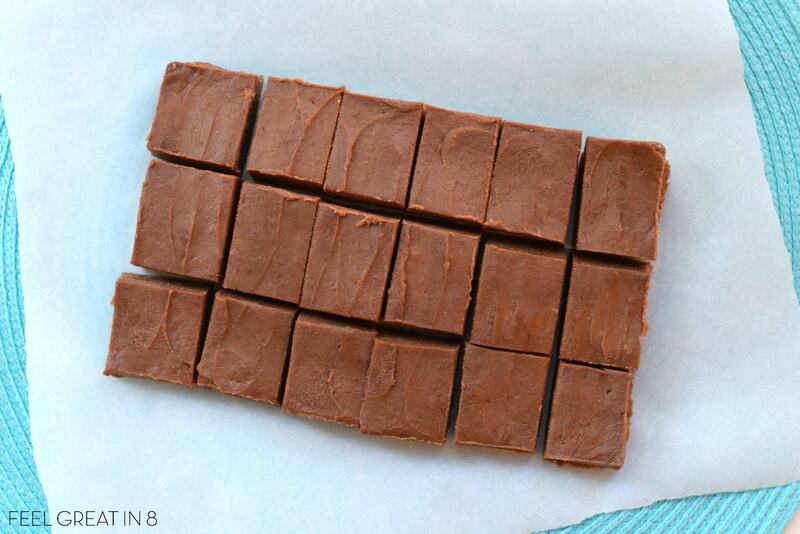 It’s dairy free, refined sugar free, and only 6 ingredients! Hey guys! Tiffany from Feel Great in 8 here. I’m so excited to be back at Super Healthy Kids! I just know you are going to love this healthy, yummy dessert recipe! I absolutely love treats that I can enjoy and share with my kids without guilt! And I love chocolate. And I love peanut butter. I also love almond butter, which would work great in this recipe too. But, enough about me. Let’s get on with the healthy goodness. 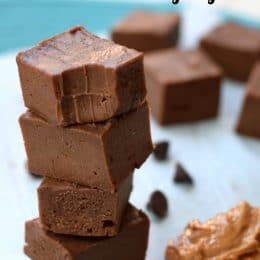 This Healthy Peanut Butter Chocolate Fudge is made without any heavy cream, corn syrup or any other refined sugar (it even has fruit hidden in there! ), but the texture is perfectly fudgy and it tastes just as rich and indulgent as its unhealthy friends. I love that you don’t have to heat your house with the oven to make this delicious dessert, and it literally takes a few minutes to throw together. The only hard part is being patient enough to wait for it to get firm (you have my permission to sneak a few tastes :). And, since you store it in the freezer, it also makes a cool and refreshing summer treat! This dessert is perfect for warm summer evenings or as an after bbq treat. 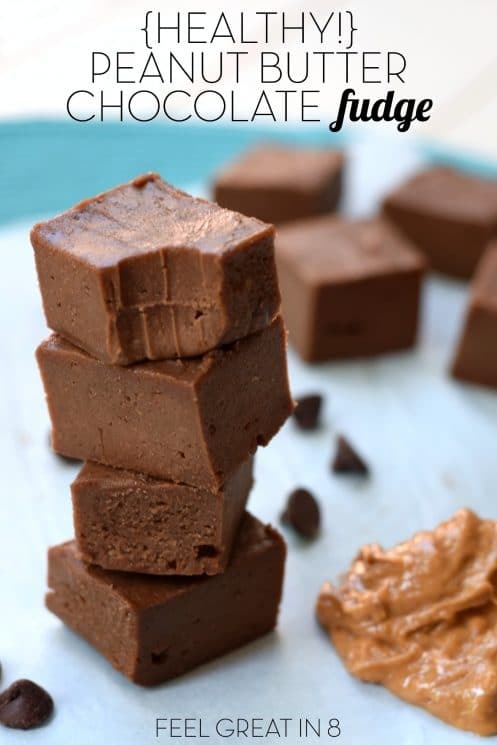 Summer evenings + healthy peanut butter chocolate fudge = perfection! I hope you’ll give this one and try and that your family loves it as much as mine does! Oh, and if you need more chocolate fudgyness, I highly recommend these Dark Chocolate Fudge Tarts. 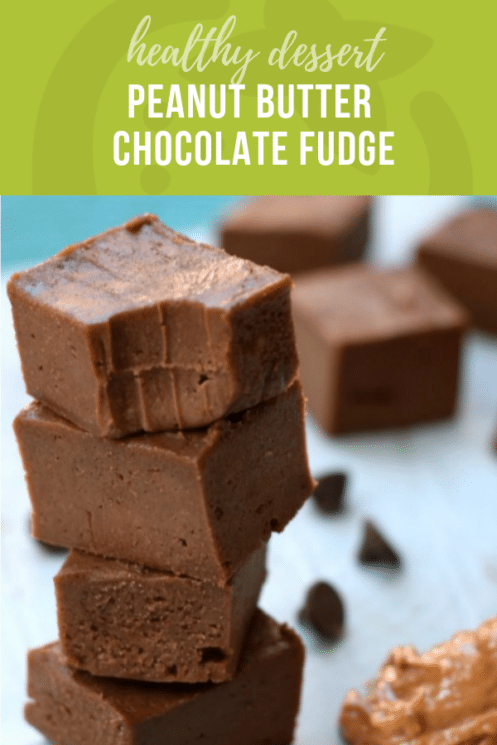 Yay for chocolate fudge! Stir peanut butter till creamy and smooth. If you need to warm it up to make it softer, it might be easier. Place all ingredients in a high-powered blender or food processor and mix until very smooth! You don’t want any lumps at all. Just smooth cream. Spread into an 8×8 pan or a loaf pan. It doesn’t need to come to the edge. Place in fridge or freezer until firm. Cut into squares. Store in the fridge to maintain solid bars. Is there something else I can use besides the coconut oil? 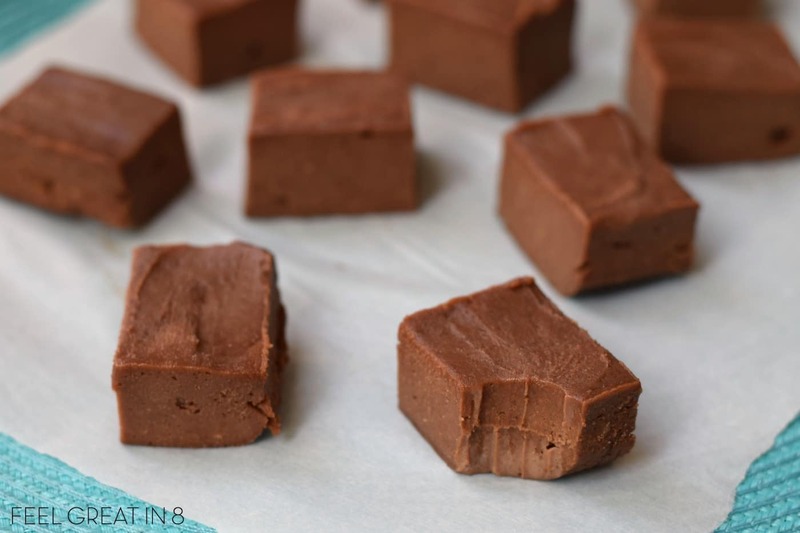 I was hoping to make this fudge this weekend but don’t have any coconut oil and wanted to hopefully use something I have at home already! Hi Heather! Unfortunately, unrefined coconut oil is so unique, it is hard to substitute (maybe coconut butter or a little avocado?). You could try it without. I’m guessing the texture would be less fudgy, but the flavor would be the same. I hope that helps! Should I melt the coconut oil before mixing all the ingredients together? Or leave it be? can i substitute maple with honey ? Definitely! Honey would work great! Fructose is fruit sugar. It’s not bad for you. What’s unhealthy is too much sugar, period. Brown rice syrup is primarily maltose. I doubt that maltose is any better for you than glucose or fructose, but the syrup has a higher glycemic index than table sugar (98 vs 65). Also apparently it can contain a lot of arsenic (!). I found that on Wikipedia when I went looking for what the sugar is in brown rice syrup, but it’s from an NIH study. The bottom line is that excess simple sugars, especially if they crowd out healthful foods, is bad for you, but specific sugars themselves are not. Honey and maple syrup are lovely, but aren’t necessarily any better for you than high fructose corn syrup or sugar. A sweetener that isn’t as sweet might be better for you if is has less simple sugars and if you don’t just increase the amount to compensate. Is it one banana or eight bananas pls? Hi! Is it possible if I switch the coconut oil with melted butter or corn oil? Hey Mikah! I’m not sure if butter would work, but I’m guessing corn oil wouldn’t. Coconut oil works well in this recipe because it is firm when cooled. Is the banana taste come through strong? I like bananas and banana bread but have made other chocolate treats that call for banana and it was so overpowering. Hi. My 4 year old really likes the look of these! Do you need to use a really ripe banana? I’m making thes right now but instead of a banana (I like them too but I don’t want the flavor in these) I’m using 6 medjool dates. I’m thinking they are a similar consistency to bananas…just going to keep trying them as I’m blending to adjust the sweetness. I’ll update when they are finished ? Can you update how the dates went? I’m allergic to banana. I’ve made this about 20 times as my kids (and I!) Love it…. I’ve only just noticed it say’s to store in the fridge. I’ve always kept it in the freezer! Having done a compare I much prefer it frozen. Like little ice cream bites & doesn’t take long to thaw to a more fudge texture. I find it too squidgy in the fridge. If you have someone allergic to peanut butter, what is a good substitute for the peanut butter? Almond or sun butter would work! Has anyone figured calories for this little bite of heaven? Is it really only a tablespoon of cocoa powder? It’s not chocolatey at all. Doesn’t taste very good. how large is one serving? Had a little taste of it tonight. Seems good. A great sweet craving type of snack. Mine doesn’t seem to as dark. And the squares seem a little hard to get out of the pan. Thinking I should have maybe put some parchment paper or something in the pan so I could get them out easier. Hoping my family will enjoy them, especially my husband who has a constant sweet craving. I didn’t add the sugar/syrup and doubled the cocoa powder. Very yummy, plenty sweet. I agree that in the freezer is best, in the refrigerator it is just squishy. Used a small banana, scant 1/2 cup coconut oil and extra cocoa powder. I made a similar recipe before, and equal amounts of peanut butter and coconut oil made it set up perfect in the fridge! Love the addition of banana! !